Our original plan after leaving Lucerne was to go to Munich and then Cologne, but Kimberley contacted us from Berlin and made it sound so good we changed our plans. So far we have not been dissapointed. The main train station, HBF, is a very cool complex. It is a huge glass and steel structure with both the DB train lines and the local S-bahn arriving and departing on three main levels. If a spacecraft zoomed in and landed amongst all the commuters I would not have been suprised as the building has a very space age feel to it. Berlin, having been all but destroyed after world war two,has regenerated itself into an extremely modern city which is quite a contrast to the other cities in Europe that we have visited. Even older buildings that survived allied attacks have been given a face lift, for example the house of Germany’s Parliament, the Reichstag. The building was opened in 1894 but has a very modern interior and is topped with a glass dome completed in 1999. From the dome you can see down into the parliament and a giant mirrored funnel allows the ministers to look back up at the people, the aim is to symbolize political transperancy and the power of the people. Music from all any point of the world. music Mp3 Downloads. mp3 music. (Music from everywhere around the world). high-quality music of all genres in popular format MP3. But if you wish to download mp3 for free you can go to mp3-generation – new type of mp3 music sites. 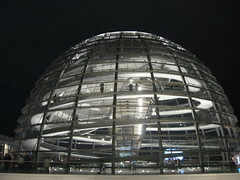 We visted the Reichstag at 10pm (its open till midnight) and from the domed roof got a good view of the Berlin City lights. Parliament was not in session but it would have been in German anyway so I am not too dissapointed. Its is interesting to note that during Hitler’s period of control he did not once step foot into theReichstag. Sorry it hasn’t taken so long to get back to you – work is far busier than I expected!! How are you travel plans going? We still have a few my entries to put up in regards to Berlin – which we really enjoyed. In fact my sister liked it so much she has a job lined up and intends to stay there! If you get this, please email me. Your hotmail email no longer works – hopefully, it’s because you’ve changed your email account and not that you don’t want to hear from us poor Canadians who are snowed under!